If you dream of running your own small business and need help getting started, you'll like Start Right: Build Your Own Business. Start Right: Build Your Own Business guides you step by step through the process of turning your dream into reality. You'll learn how to write a thorough business plan, find the money you need to get started, and fully prepare yourself to set up, organize, advertise and run your own business. Start Right: Build Your Own Business gives you easy-to-understand information that will help you avoid many common, costly business mistakes. 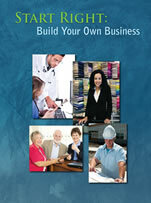 Start Right: Build Your Own Business is available as a hands-on workbook or as an online program. Hands-on activities will help you write a detailed business plan. You'll map out a clear and complete description of your business. When you are ready to apply for a business loan, you'll impress lenders by being fully prepared to explain your ideas. You can find the money to start a business. Start Right: Build Your Own Business explains your options, from keeping your day job to finding investors. Knowing the benefits and drawbacks of every option will help you make the best choice for you. You'll know how to manage your personal and business finances. When your personal finances are in good shape, you'll be better prepared to manage your business finances. Charts and worksheets will teach you how to effectively handle your personal finances, and how to understand and manage your business books. You'll learn how to choose an accountant, an attorney and other professionals whose advice you'll need while you start and run your business. You'll learn how to choose professionals you feel comfortable with, how often to meet with them and what questions to ask. Checklists and activities throughout the book will help you stay organized and on track. As you complete the checklist of items in each chapter, you'll move forward with confidence, knowing that you are more prepared to succeed as a business owner. You'll learn how to avoid common business mistakes. Start Right: Build Your Own Business draws on 30 years of experience from an expert who helps business owners start and run successful small businesses. If you apply the information in Start Right, you can run a business. Everything is spelled out in this step-by-step guide -- from raising money to talking to your family to marketing your new business – and it’s done in a way anyone can follow. Perhaps the most valuable section is a list of detailed questions that Start Right: Build Your Own Business insists the would-be business owner answer as part of writing a business plan. If you can’t answer each question with specifics, then you aren’t quite ready to launch a business, the book advises in a no-nonsense fashion. You have more work to do first. Start Right: Build Your Own Business also offers lots of references to additional resources where entrepreneurs can find even more detailed advice and guidance. Start Right: Build Your Own Business delivers what it promises – the right start on the path to owning your own business and fulfilling a dream. The information in this book is easy to use and the checklist of "to do's" helped me to believe that starting a business was something that I could do. What I liked best was in the online version I was able to download and save real accounting worksheets in Excel. They were worksheets like profit and loss statements, statement of cash flows, etc. Before taking this course, I'm not so sure that I would know what to expect when it comes to those. Much of the other information is useful in that it gives tips that you don't really think about. Probably the other thing I liked about it was that it organized all the information in one place of things like what state agency I need to register my business name with or which questions to ask potential lawyers, bankers and accountants. Very well written and easy to understand, and is excellent for anyone who is starting or purchasing an existing business. For businesses that are less than five years old, it’s very helpful, or for one-person businesses that want to expand, Start Right: Build Your Own Business can be very helpful. I am an organization freak. I loved Chapter 7 about files and organizing. I took that information and put folders exactly as it described, and that was very helpful. Step by step, it tells you how to organize all your information so you can quickly reference it. If you don’t have your personal finances in order, don’t expect to start a business. Don’t blend business and personal finances –that was the biggest reality check from Start Right. “Start Right: Build Your Own Business” offers entrepreneurs an opportunity to learn the steps to starting their business in a user-friendly format. The 119-page book is more like a workbook to assist entrepreneurs in getting organized to establish a business. From the beginning, the book is in a logical sequence that shows the entrepreneur that there is more to starting a business than just having a product or service. The book covers setting goals, researching the market, preparing financials, and creating organizational plans. In addition, each chapter has a checklist of ‘To Do’s’ and at the conclusion of the book is an entire checklist that the entrepreneur can complete as he/she proceeds to the world of small business. The book is written in terminology that is easy to understand and contains a plethora of resources to help the entrepreneur be successful. Q.) Will I get the same information in the online program as I would in the book? A.) Yes, you will. All of the tools featured in the book are provided in multiple formats online. The online program gives you downloadable forms that are compatible with various kinds of software. Whether you choose to print or save, the forms are yours to keep. Q.) I have a great idea for a business but I'm not good at organizing. What can Start Right do to help me succeed? A.) Start Right has all of the organizational tools you will need. Checklists, forms and action steps for each chapter will help you do all of the right things in the proper order. Q.) I don't know anything about starting a business. Is Start Right the right book for me? A.) Yes, Start Right: Build Your Own Business is perfect for you. The information is clearly explained and easy enough for anyone to use, whether you have any business experience or not. Q.) I already own a small business, but it's struggling. Can Start Right help me? A.) Yes, Start Right is full of information you'll want to refer to again and again. It tells you how to understand your business books, how to organize your office and files so you save time and money, how to manage your time, and how to market your business. You'll also find lists of resources you can use when you need more help. You can use the information in Start Right to help your business run smoothly. Q.) I am an accountant. Many of my clients want to run businesses or already do, but they need help. I'd like to offer a class or workshop to help them. Can I use Start Right for that? A.) Yes, you can. PowerPoints and an instructor's guide are available. Whether you're leading your first workshop or you're an experienced teacher, our PowerPoint presentation and instructor's guide will help you easily lead a class or workshop. E-mail our staff at team@financialeducationprograms.com for more information.